These large beaded hoop earrings are beaded with 7 rows of small seed beads on white leather. They measure approximately 3/8" wide and have about a 2" hoop diameter. 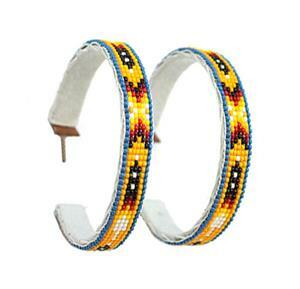 Crafted by Navajo artisan Dean Martin. ***Only available in blue as primary color. *** None available like pictured.